The human body is exposed to a wide variety of toxins on a daily basis including chemicals found in foods, environmental toxins, and pharmaceuticals. The liver is the body’s main detoxification organ which provides enzyme systems that safely process and remove xenobiotics (foreign chemical substances) out of the body, as well as unhealthy hormone metabolites. These detoxification systems are very complex and require a variety of nutrients for optimal function. There are two main pathways of detoxification in the liver, known as phase I and phase II. In phase I, composed mainly of cytochrome P450 enzymes, non-reactive compounds undergo specific reactions which use oxygen to form a reactive site on the compound. Most pharmaceuticals are metabolized through Phase I biotransformation. This prepares the metabolite for the next step of detoxification. 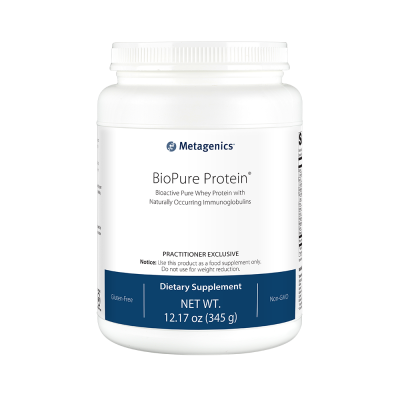 Phase II is a crucial step- if molecules from Phase I are not fully metabolized by Phase II conjugation they may cause free radical damage to proteins, RNA, and DNA within the cell. Phase II reactions result in the biotransformation of fat-soluble compounds into water-soluble compounds that can then be excreted in the urine, bile, or stool. The ingredients included in Core Support were chosen for their ability to support one of the six pathways of phase II detoxification. N-acetyl cysteine along with glycine and taurine are well known amino acids for their role in supporting the liver. Antioxidants such as lipoic acid, green tea, ellagic acid and the vegetable antioxidant blend provide a synergistic approach to liver support and promote enhanced detoxification. Core Support was created as part of the Core Restore Kit. 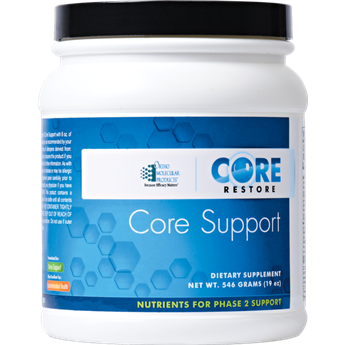 Core Restore supports Phase II liver detoxification by providing protein, fiber, and nutrients to help eliminate toxins from the body. Suggested Use Mix 2 scoops (39.0 g) of Core Support with 8 oz. of water or the beverage of your choice two times daily or as recommended by your health care professional.